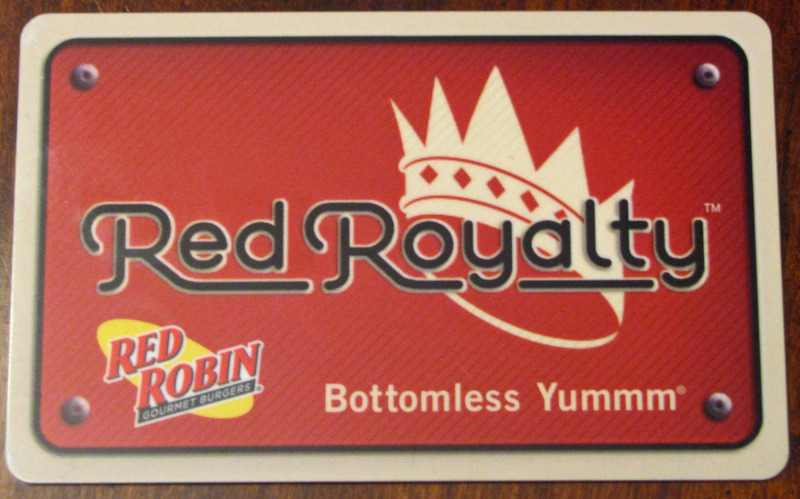 Home › Living Vegan › Really, Red Robin? It is so disappointing when a restaurant you think “gets it” … doesn’t. Of course I’m talking about Red Robin. For a chain of its type, Red Robin seemed like it was really making an effort to reach out to people on a plant-based diet. A Gardenburger for vegetarians, a Boca burger for vegans. Two choices of bun (whole grain and sesame) that are completely vegan – including the mono- and diglycerides and sodium steroyl-3 lactylate. Fries cooked in vegetable oil in a fryer reserved exclusively for fries. A willingness to make substitutions and modify your veggie burger any way you want. I’ll be honest, I wish they had a house-made vegan burger patty instead of Boca. But still, it’s a great thing to be able to go to a chain restaurant with your friends … or your coworkers … and get a decent vegan meal. And then … the commercial. You can see the commercial on YouTube here. There’s been a lot of uproar. Many vegetarians and vegans were understandably offended. I was offended. I’m not a teenage girl. In fact, I’m old enough to be the mother of a teenage girl. And I’ve been veg for almost 14 years now. That’s one hell of a long “phase”. And Red Robin may be surprised to learn many vegetarians and vegans are not female at all! Does anyone mistake Mike Tyson for a teenage girl? Ozzy Osbourne? Carl Lewis? Russell Brand? 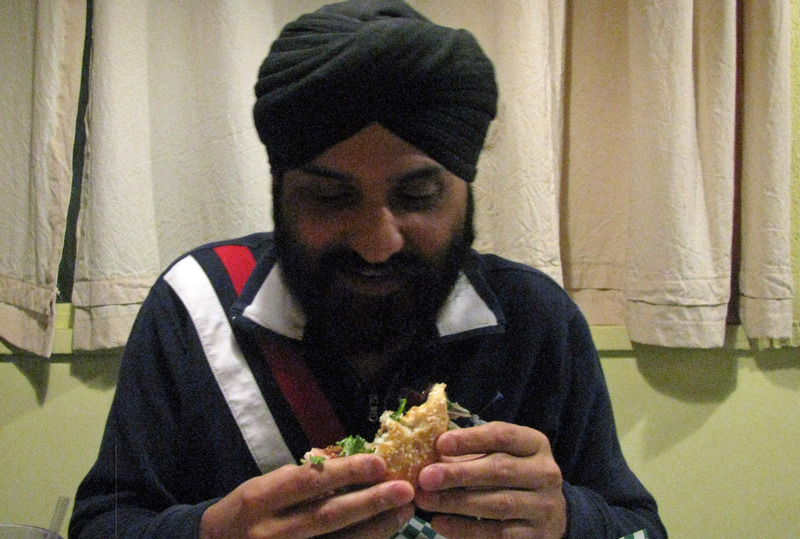 Even, my bearded Punjabi partner? Many omnivores, and even some prominent vegan bloggers, suggested we veggie people need to get a sense of humor. The problem is, that commercial just wasn’t funny. What would have made it funny? Well, for starters, if the “waitress” hadn’t had such a snarky smirk on her face. It was her expression and tone of voice as well as the words. She didn’t deliver the line “just in case your teenage daughter is going through a phase,” in a smiling, teasing way. All that actress did was convince vegetarians that if they dined at Red Robin and ordered a Gardenburger, they would be treated rudely by the waitstaff. Or, maybe it would have been funny had they used some other vegetarian stereotype other than “a teenage girl going through a phase.” An adult stereotype. A bunch of tattooed rockers swaggering into Red Robin and demanding veggie burgers. A dozen eco-conscious, tree-loving vegetarians tumbling out of a tiny hybrid car like clowns. Even peace and love hippies. 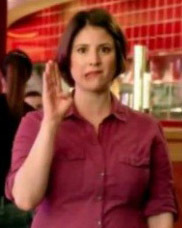 My advice to Red Robin? Get a few vegetarians/vegans into your focus groups – not just omnivores! Yes, the omnivores might know a few vegetarians – like their teenage daughters. But look where that got you. And your apology doesn’t help. Um, IF? Why not say, “We’re sorry we offended many of our customers. That was not our intent and we have removed the commercial.” And then, come out with another commercial. One that’s actually funny this time. Or one that doesn’t even try to be funny because, honestly, Red Robin, you don’t do funny all that well. And my advice to all the vegetarians and vegans who were offended by this ad? Remember you have a voice. Go to the Red Robin website and leave a message with customer service. Go to the Red Robin Facebook page and message them. You could also leave a comment, but be prepared to get flamed! Look on Facebook for your local Red Robin restaurants. If they have a page – message them or leave a comment there, too! If you Twitter … tweet! We can be heard … IF WE SPEAK UP! I don’t usually pay attention to commercials, so I hadn’t heard about this. That commercial makes me sad, as there are so many other commercials they could have done instead. I love all of the suggestions you gave. Any of those would have been better. We always criticize the people who are offended, not the people who do the offending. It’s sad, really. This wouldn’t have been such a horrible commercial if vegans and vegetarians weren’t made fun of constantly. It’s one thing to make fun of people with power. It’s quite another to make fun of people who are already looked down on by the majority of the population. I became vegan as a teenager, 17 years ago. It’s been a long phase for me too! We eat at Red Robin every now and then. I too wish they had a house made veggie burger. It’s not even that hard I’m sure their cooks can handle it. I haven’t seen this commercial though. Some people will never get it. That’s true … some people will never get it. This commercial was just extra-disappointing to me because I truly believed that they “were” starting to get it … the veggie and vegan burgers, the vegan buns, the separately cooked fries, the fruit salad side. Oh, well. OMG yes! I hate that ad. I remember when it first came on, I was like…whaaa? Way to marginalize a growing population Red Robin. I also found the commercial sexist too as in…”oh silly females and their phases”. I found the commercial sexist as well (and possibly ageist?). I know a number of teenage girls (boys, as well) who started as vegetarians or vegans in their teens and continue the lifestyle well into their 20’s. I also know a teenage girl who’s vegan, involved in several animal charities, and also has her own Meetup group that fights against animal cruelty. I’m willing to bet this girl isn’t going through a phase. But … whew … if I touched on every way that commercial offended me it would have been one loooong, loooong post.